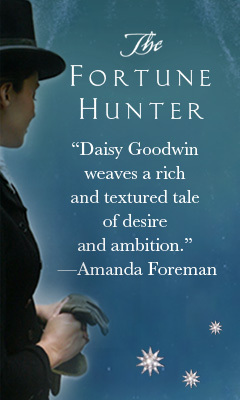 At the heart of Daisy Goodwin's The Fortune Hunter is a passionate love triangle that plays out in the ballrooms and on the hunting fields of Victorian England. As with her first novel, The American Heiress, which is based on the life of wealthy American Cora Cash, who married into the British aristocracy, this intriguing story was inspired by an actual figure: the Empress Elizabeth ("Sisi") of Austria. Goodwin describes the empress in her author's note as the Princess Diana of 19th-century Europe--famously beautiful and unfulfilled in her marriage to an older royal. Readers have to wait a bit before meeting the Austrian monarch. Goodwin opens The Fortune Hunter with the other central female character in the story, Charlotte Baird, who might well be the only woman in London who dreads having a full dance card. Instead of being forced to make small talk with bumbling suitors enticed by the fortune to which she's the sole heir, she would rather be taking photographs. Mentioning her unusual pursuit--a cutting-edge development at the time--is usually a conversation stopper and ensures she isn't asked to dance a second time. Twenty-year-old Charlotte knows she can't avoid marriage forever, but none of the men she meets holds her interest... until Bay Middleton. Undeniably handsome, the dashing cavalry captain is also witty, easygoing, kind and intrigued by a woman who would rather stand behind a camera than have a dress made. But in this gilded world, which Goodwin re-creates in glittering detail, marriage is less about matters of the heart and more about advancing one's social status. Charlotte's imperious half-brother and guardian, Fred, and his ambitious fiancée, Augusta, warn her away from Bay, declaring him to be a ladies' man and a fortune hunter. Even worse than Bay's reputation for dallying with married women is that he's untitled and of modest means. Just as Charlotte and Bay's secret relationship escalates from flirtation into something more serious, the empress enters the picture. Bay is widely acknowledged as the best rider in England, and his commanding officer assigns him to act as Sisi's pilot. His task is to guide her across the English countryside and through the protocols of one of the most prestigious and challenging fox hunts. Attractive and athletic, intelligent and adventurous, 38-year-old Sisi seems to have everything. In truth, she is desperately lonely--at age 15 she married the Emperor Franz Joseph, a man with little time for anything other than presiding over his kingdom--and despairing over the toll age is taking on the beauty that has been "her weapon and her power." Having escaped the stifling formality of the Austrian court and desperate to outrun her anxieties, Sisi arrives in England eager for the excitement of the hunt. Despite Bay's reluctance at being tasked as a "royal nursemaid," he quickly warms to Sisi, impressed by her riding skills and her fearlessness in leading the pack with him during the hunt. Plus, he's far from immune to her lauded looks. The Fortune Hunter unfolds from the alternating perspectives of Charlotte, Bay and Sisi, allowing readers to get to know each character intimately--their hopes, fears, desires and driving factors. The story's strength is its portrayal of two vastly different yet strong, remarkable women. While Sisi is bound to a life of duty, the orphaned Charlotte's inheritance allows her a certain amount of control over her own life and the freedom and means to pursue photography. While Sisi's celebrated visage sells everything from chocolates to liver salts in Vienna, Charlotte is constantly reminded that hers is "not a face to launch a thousand ships." The empress crashes a wedding to size up Charlotte and leaves satisfied that someone so plain-looking couldn't possibly be a rival for Bay's attention. The empress cuts an imposing figure across the pages of The Fortune Hunter, but it's quirky, spirited Charlotte who steals the story. When we first meet her she's pondering whether Queen Victoria should be a kitten or a cod fish as she alters a photo of the British royal family, superimposing images of animal heads onto the faces of the monarch and her clan. Photography is an integral aspect of the storyline. Charlotte's passion for the pastime illuminates her unconventional character. Toting around camera equipment and having silver nitrate-stained hands from developing plates is considered "deuced odd," Fred tells her, and might give her a reputation. The photography theme also compels the plot forward at several pivotal points. Goodwin does a terrific job conveying the impact of this strange, powerful new medium and its effect on people seeing fixed images of themselves for the first time. As Bay finds out, what is reflected back sometimes reveals truths you'd rather keep private. When the hunting party gathers one morning before setting out on the chase, Charlotte takes a candid shot of the empress and Bay off in the distance. After developing the photo, she sees him gazing at the monarch with obvious adoration and lust. Charlotte doesn't wait around while Bay equivocates between wooing her and spending time with the empress (with whom he hunts by day and begins secretly trysting with by night). She heads for London to help her godmother, a photographer and her mentor, prepare entries for a prestigious photographic exhibit that will be attended by Queen Victoria, and then makes plans to journey to America. Goodwin keeps the romantic tension taut until the very end, when Bay--who genuinely cares for both women--ultimately must decide where his heart lies. Will he publicly declare his allegiance to the empress, at her urging? Or, thanks to a twist of fate, will he grasp a second chance to reunite with Charlotte, if she hasn't yet sailed beyond his reach? 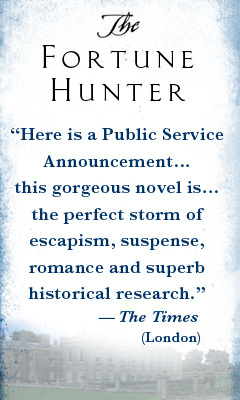 Listen to a clip from the audio of The Fortune Hunter, narrated by Clare Corbett (ISBN 9781427236111, $39.99, 12 CDs, 14 hours), here. 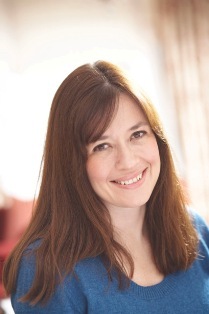 Daisy Goodwin, a Harkness scholar who attended Columbia University's film school after earning a degree in history at Cambridge University, is a leading television producer in the United Kingdom. She is also a book reviewer for the London Times and was chair of the judging panel for the 2010 Orange Prize for Fiction. 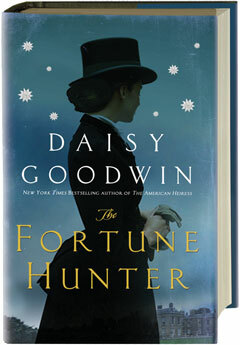 The Fortune Hunter is Goodwin's second novel, following the New York Times bestseller The American Heiress. What was your inspiration for writing The Fortune Hunter? How did a jigsaw puzzle play a part? I have been fascinated by the Empress Elizabeth of Austria, or Sisi as she was known to her family, ever since I was a little girl. I was given a jigsaw puzzle of the famous Winterhalter portrait of the Empress wearing a spangled ball gown and diamond stars in her hair when I was recovering from an operation, and I remember spending hours trying to fit her together. Someone knocked the puzzle over when I was halfway through and some of the pieces were lost so I never managed to finish it but, as so often in life, it is the unfinished images that linger in the memory. Years later I visited Vienna, and I went to the Hofburg Palace and saw the original picture that my puzzle was based on. I started to research Sisi's life, and I was astonished at what a contemporary figure she seemed. Her worries over her weight, her fading beauty and her quest to find meaning in a life of unlooked-for celebrity all seemed to me to be very contemporary issues. When I discovered that Sisi came to England and had had a relationship with the splendidly named Captain Bay Middleton, I realised that my next novel was taking shape. Although it takes some liberties with the chronology of Sisi's visits to England, all the characters in it are based on real people. I love trying to create living, breathing people out of the names you read in history books. The title character is Bay Middleton, the man at the center of a love triangle. When did he first come to your attention? What can you tell us about him, both the fictional version and the real-life figure? I started researching The Fortune Hunter around the time of the royal wedding, so obviously anyone with the name Middleton leapt out at me. And Bay is such a glamorous nickname. I think I fell in love with his name first and the rest followed. When I started to research his life, I found that he was a famous ladies' man. Before his liaison with Sisi, he was having an affair with Blanche Hozier, a married society lady. It is quite likely that Clementine, her daughter, was actually Bay's child. Clementine Hozier, of course, went on to marry Winston Churchill. Bay was the greatest horseman of his generation, and he was just as famous in hunting circles as Sisi was in Vienna. I recently met his great-great-granddaughter, who is a well-known TV presenter in the U.K., and discovered that she has called her younger son Bay. The real-life Bay was probably slightly less handsome than the fictional one, and there were some reports that he might have been slightly deaf. But I suspect that he was one of those men who feigned deafness when he found people boring. In real life and on the page, his two interests are horses and women. In real life, his relationship with Sisi went on for at least five years. But although they stopped hunting together, I suspect that Bay never got over Sisi entirely. When he died in a hunting accident in 1892, the medallion that she gave him at their last meeting was found in his pocket. The reality of his life came home to me when I visited his grave in a small churchyard in Leicestershire. There was a beautiful stone Celtic cross with his name BAY across the central strut. But the really touching thing was that someone had laid fresh flowers at the base. I think it must have been a woman. Even a hundred odd years after his death, Bay Middleton still has his female admirers. Much less is known about Charlotte's life than about Sisi's. Which character was more challenging to create? Did you empathize with one woman more than the other? There have been numerous biographies of Sisi (the best is The Reluctant Empress by Brigitte Hamann), but Charlotte Baird's life is pretty much unrecorded. So when I write about Sisi I am fleshing out what I have read about her, even if I do give her my own spin. With Charlotte, I really had a blank slate so I tried to come up with a character who would have nothing in common with Sisi, except of course her interest in Bay. I had enormous fun getting inside Charlotte's head. She pretty much wrote herself from the very first sentence. As she says to Bay, she is the sort of woman who notices things. The other thing I love about Charlotte is her irreverence. I suppose because she is an orphan, the worst things in life have already happened to her, so she has no fear. But I also have some sympathy for Sisi. It must be hard to be continually surrounded by people who fawn on you to your face but are poisonous behind your back. Sisi is closer to me in age and, I suppose, I have given her some of my own concerns about getting older and losing appeal, although I am not quite in her league. Why did you decide to give Charlotte an interest in photography? I have always been fascinated by the impact the advent of photography must have had on people's perceptions of themselves. To see yourself as others see you, for the first time, must have been a revelation in the 1860s and '70s. Today photography is commonplace, but then it must have changed the way people thought about everything. Imagine being able to see a photograph of a desert or a glacier. It must have been an extraordinary moment. Some of the most interesting photographers at that time were women. I have based Charlotte's godmother on a real-life female photographer called Lady Hawarden. I wanted Charlotte to have a lens, literally, through which to see the world. The things that photographs reveal is a theme in the book. It also ties the two women in the book together. Sisi was so worried about unflattering photographs that she carried a leather fan with her wherever she went to shield herself from Victorian paparazzi--the 19th-century equivalent of a baseball cap and sunglasses. How did you go about researching different aspects of The Fortune Hunter, such as the time period, the settings and the details on hunting? Did you visit Windsor Castle, where Sisi and Bay have a tête-à-tête with Queen Victoria in the story? History was always my favorite subject at school so the research for this book was an absolute pleasure. I spent hours in libraries reading about Victorian racetracks and visiting obscure museums which have authentic ladies' side saddles. I did go riding quite a lot when I was writing the book just to remind myself what it is like to go really fast across open country, but I was too scared to gallop. Fox hunting is a really extreme sport. I have been on a day trip to Windsor Castle, but I read a great deal about what it must have looked like in the 1870s. In addition to The Fortune Hunter, you're the author of The American Heiress, which takes place in the late 19th century. What draws you to writing historical fiction?